Lightweight oblong case. 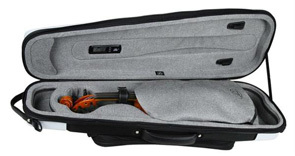 Two bow holders, 3 accessory compartments, microfiber lining with leather trim, suspension system, music and separate metronome pocket, retractable backpack straps. 5 pounds. New model with compact size, and cleaver features. 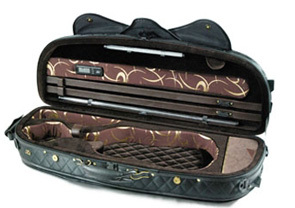 Two bow holders, music pocket, subway handle. 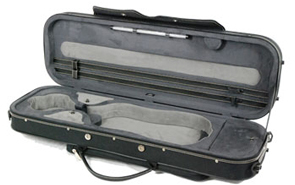 Shoulder rest space is not a common feature of cases which are not oblong, but this model can accommodate most popular models of shoulder rest. Backpack straps stow neatly behind the music pocket, when not in use. 4.4 pounds.